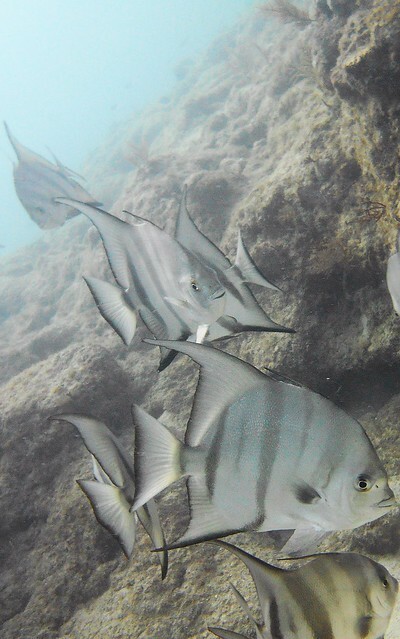 What was the Reef Report today in Key Largo, Florida Keys? Scuba and Snorkel Tours with diving guide Michael and snorkeling guide Jennifer reported that the reef just could not be any nicer for this time of the year. Gentle rolling seas from the calm East winds and lack of a strong current made for an excellent afternoon. Visibility was extremely good today at both Eagle Ray Alley and Wellwood Wreckage areas of Molasses Reef. Add all that with wonderful fish sightings and you end up with the single word PERFECT. This Afternoon at Eagle Ray Alley PADI Instructor Mike guided our group of divers around and looked for Eagle Rays, Southern Stingrays and Sharks. Snorkeling guide today was Sail Fish Scuba owner Jen Kerr and she taught the snorkeling group all about FISH ID during both sites. Snorkeling with Bull, Black-tip and Caribbean Reef sharks today! The second site at Wellwood Wreckage Area snorkeling guide Jen took her group of snorkelers and searched for colorful Rainbow Reef Parrotfish. Key Largo reef sites are teaming with such colorful fish and corals. PADI diving guide Mike explored the site pointing out all the historical old shipwreck pieces. Reef Report for Key Largo was in one word perfect for this time of the year today. Scuba and Snorkel Tours guided by the fun staff of Deeper operated by Sail Fish Scuba just could not have been better. When the dive staff states they had so much fun today working, you know it was a great day. What a Reef Report for Key Largo today! fun for all Sail Fish Scuba guests today. Awesome Reef Report in Key Largo. Scuba and Snorkel Tours such fun. One word: Perfect. Scuba & Snorkel Tours such fun.